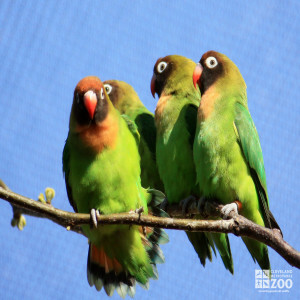 The black-cheeked lovebird is a small parrot that is mainly green with an orange patch on the breast, brown head and black face, with a white ring around the eye. They are around 14 centimeters long, with a very short tail. Black-cheeked lovebirds can be found in Southwest Zambia. The habitat of black-cheeked lovebirds includes tropical dry forest and tropical grassland where permanent supplies of surface water exist. Black-cheeked lovebirds spend much of the day feeding on grass seeds near the ground. Drinking water is important since their food is low in moisture. If threatened, they fly silently into the nearest tree. They sleep with their heads tucked under their wing. They are very noisy, uttering a variety of loud shrieks and calls in flight. Black-cheeked lovebirds breed in holes in mature mopane trees near roosting sites from January to May. Breeding pairs probably use the same nest site year after year.